The horrific scene on Liberty Avenue downtown earlier today. (Pittsburgh, PA) Mayor Peduto made an impassioned plea to band together and rebuild the city today, after gentle wafting precipitation wreaked havoc throughout its neighborhoods. Pittsburghers have sought strength from each other just as they did in the far-less-damaging Blizzard of ’93. Often the simple act of sharing horror stories can offer the best kind of cathartic healing. Even President Trump is helping, promising emergency relief through FEMA by declaring Southwestern Pennsylvania a Federal Disaster Area. Those caught outside are advised to remain calm and gently bat the snow off their clothing should any accumulate. 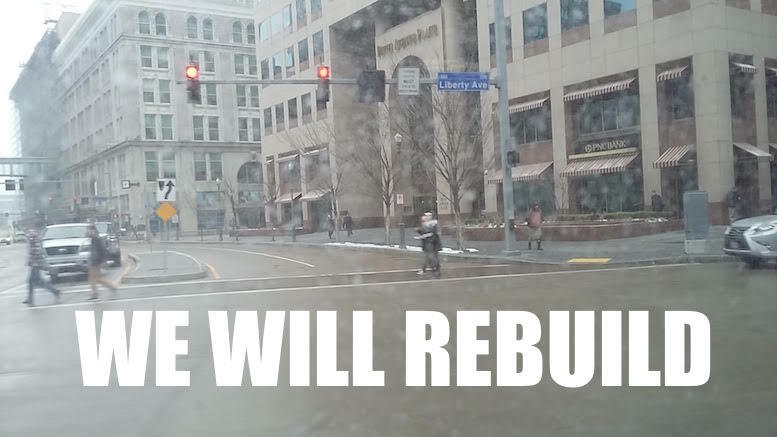 7 Comments on "Pittsburgh Vows To Rise Again After Being Devastated By Mild Flurries"
It must have been overwhelming. 10:45 Sunday night and my block still hasn’t been touched. I think the city could’ve done more icing on the streets. The roads would’ve been much safer and we could’ve at least left our homes for supplies. They were out. They were not “icing” they were salting the roads..unfortuanetly, when the dregree drops under a certain temp. The salt does nothing. They can only do so much! Have some respect, get your “supplies” ahead of time if your that worried! this web site contains amazing and in fact excellent information in favor of readers. we love your sweet poetry, hyperdrive! rock on! I just saw where a tornado hit Braddock. It did $20 Million Dollars worth of improvements. The Swedish embassy may have helpful advice here……..